It is difficult to avoid being caught up in the hero-worship surrounding Ronald Reagan, and I feel compelled to deepen the national exaltation of the “The Gipper” with my own burnt offerings. But I must warn you dear reader, my version of the Reagan chronicles might seem decidedly heretical. My alternate take on his saga is here conveyed through the graphics I created during his time in office. Mind you, the images I have selected for this article are but a smattering of the anti-Reagan artworks I created during his ignoble reign, yet they help provide a more complete picture of the period, for the so-called “Teflon President” faced broad, implacable, and widespread opposition to his backward-looking and retrograde policies. "Nuclear Cowboy" - Mark Vallen 1985. Offset flyer. 8.5 x 14 inches. 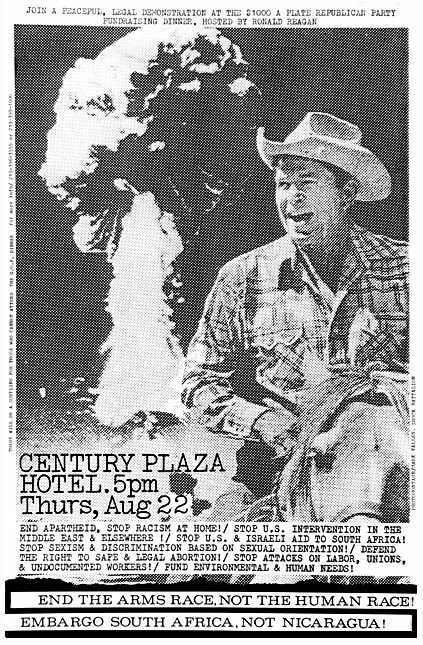 My intentionally crude Xerox photomontage, Nuclear Cowboy, was used as the central image for a flyer that announced a mass protest against President Reagan at a $1,000 dollar a plate fundraising dinner for the G.O.P. at the L.A. Century Plaza Hotel, August 22, 1985. The protest was organized and sponsored by a variety of organizations, from the Alliance For Survival and the Coalition For A Free South Africa, to Jews United For Peace & Justice and the Committee In Solidarity With The People of El Salvador (CISPES). 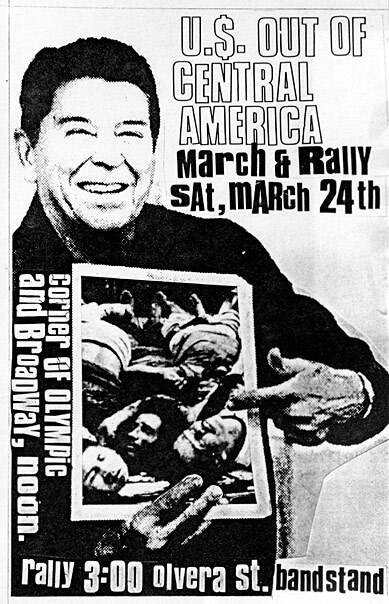 Reagan addressed the fundraiser, and the demonstration was attended by approximately 10,000 protestors, making it one of the major rallies against the policies of Reagan to be held in Los Angeles during the 1980s. Just two months prior to the protest, Reagan escalated his illegal and unilateral war against Nicaragua by declaring a crippling economic embargo against the Central American nation, accusing its leftist Sandinista government of backing “armed insurrection, terrorism, and subversion in neighboring countries.” Reagan declared his embargo after the U.S. Congress had rejected his request for tens of millions of dollars for the “Contra” guerrillas the White House had organized, financed, armed, and directed in military attacks against Nicaragua. "Soldier Of Fortune" - Mark Vallen. 1985. Photomontage. 8.5 x 11 inches. 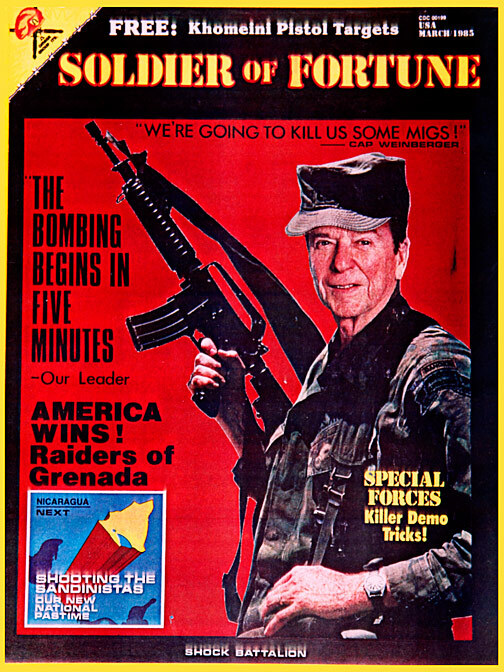 Soldier Of Fortune was my parody photomontage flyer lambasting the militaristic policies of the Reagan administration. I altered a cover of the rightwing magazine, Soldier of Fortune (an extreme rightist publication in the U.S. that openly recruited American mercenaries in the early 80s to fight in South Africa, Afghanistan, and Central America), inserting a photomontage of Reagan as the supreme mercenary commando, along with some tantalizingly jingoistic headlines. The tagline of “Shock Battalion” appearing at the bottom of the photomontage was the name of an arts collective I founded in the 1980s that primarily unleashed anonymous creative acts. The flyer was published as a color Xerox print. While campaigning for re-election in 1984, Reagan let slip his “witticism” to radio technicians while preparing for his weekly Saturday address on National Public Radio. The Commando in Chief’s quip went as follows; “My fellow Americans, I’m pleased to tell you today that I’ve signed legislation that will outlaw Russia forever. We begin bombing in five minutes.” The recorded jibe was leaked and people around the world were naturally horrified. The Soviet Red Army was actually placed on high alert after hearing of the crack-pot remark. The joke soon found its way onto flyers, posters, and protest signs around the globe. Musicians Jerry Harrison (Talking Heads) and Bootsy Collins (Parliament-Funkadelic) sampled Reagan’s sinister comment, turning it into a 1984 hit dance record titled Five Minutes. Harrison and Collins released their record under the name “Bonzo goes to Washington,” a reference to Reagan’s starring role in the 1951 B-movie, Bedtime for Bonzo. "Divest Now!" - Mark Vallen. 1985. Offset flyer. 8.5 x 11 inches. Divest Now! 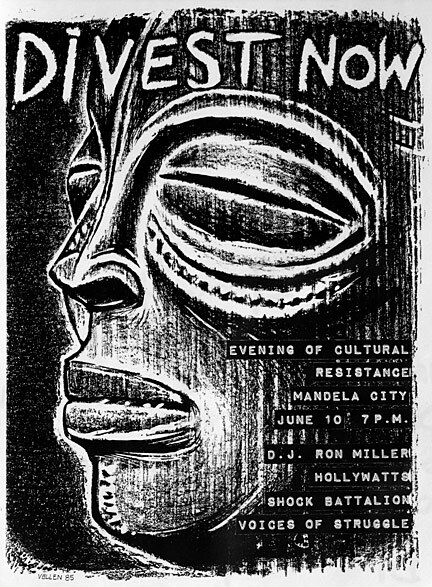 was a flyer I created in 1985 for the anti-apartheid student movement then active on the campus of UCLA (University of California, Los Angeles). At the time students throughout California were engaged in an aggressive campaign to force the UC system to “divest,” i.e., to withdraw the huge financial investments made in the apartheid regime of South Africa. The UC Regents supported apartheid by investing 30% of the UC system’s portfolio in corporations and financial institutions that conducted $1.7 billion worth of business transactions with South Africa. Through unrelenting militant struggle the students eventually forced the UC system to divest their holdings in South Africa, helping to pave the way for the total collapse of the rotten apartheid regime. My flyer announced an “Evening of Cultural Resistance” in celebration of the student occupation of the UCLA administration building, a takeover that demanded divestment, the release of Nelson Mandela, and an end to all U.S. military and financial support to the racist South African regime. The event took place in “Mandela City,” a tent encampment students had illegally set-up adjacent to the administration building. During that evening’s staging in front of a hundred striking students, I performed a multi-projection antiwar slide show, and singer-songwriter Carole King dropped in unannounced to lend her support and sing a few songs. The performer listed as “Hollywatts,” would in the future go on to use his real name, Roger Guenveur Smith, appearing in several productions by Director Spike Lee. It must be noted that L.A. student opposition to UC investment in apartheid was also part of the broader national and international refusal to accept Reagan’s support of the criminal South African regime. Reagan maintained a very friendly relationship with that government, considering it an ally in his fanatical crusade against “communism.” The Reagan administration viewed Nelson Mandela’s ANC (African National Congress) as a “terrorist” organization under the influence of the Soviet Union, and Reagan himself vetoed a congressional bill to impose economic sanctions against the government of South Africa. "We Abhor Apartheid" - Mark Vallen. 1985. Offset flyer. 8.5 x 11 inches. 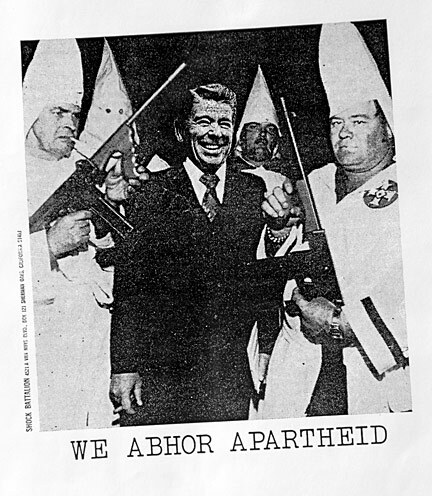 We Abhor Apartheid was another street flyer I created in 1985 as a satirical barb aimed at Reagan’s policy of propping up the South African racists. I self-published five thousand copies of this flyer, all of which were distributed throughout Los Angeles. "March & Rally/Marcha y Mitin - Mark Vallen. 1985. Offset poster on newsprint. 13.5 x 22 inches. 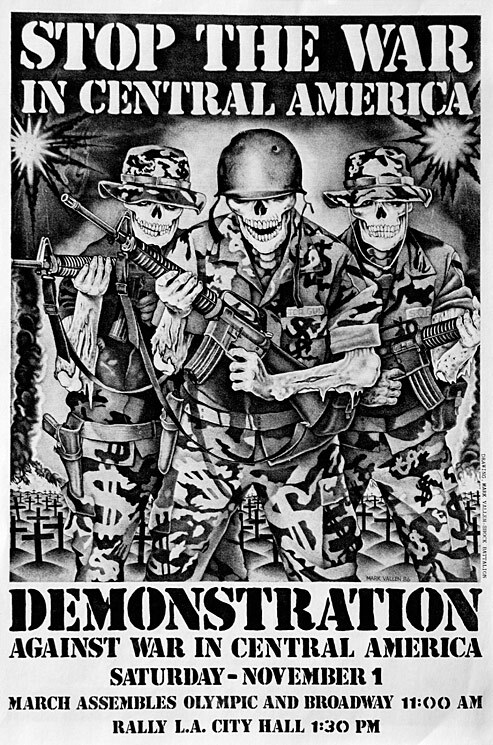 Poster announcing a mass antiwar demonstration in downtown Los Angeles. March & Rally/Marcha y Mitin, was a drawing I created for the “April 20 Coalition.” In opposition to the reactionary policies of Reagan, the national protest group organized mass demonstrations in New York City, San Francisco, and Los Angeles that took place on April 20, 1985. My commissioned pencil drawing reflected the central demands of the protest; no U.S. intervention in Central America, an end to the arms race, and stopping U.S. support for the racist regime in South Africa. My drawing was published as a bilingual pull-out poster in the L.A. Coalition’s broadsheet newspaper, of which some 10,000 copies were published. Thousands of copies of this poster were circulated in L.A., with many appearing on city walls. The signs depicted in my drawing were accurate representations of placards and posters carried by protestors at the time, some of which I had designed myself, such as the silkscreen posters “No Más Guerra,” and “Solidaridad con el Pueblo de Guatemala.” As a historical/political time capsule, the most astonishing facet of my poster has to do with the left opposition’s call for a liberated South Africa. The African American portrayed in my drawing of course carries a sign that reads, “Free South Africa - End Racism,” but he also wears a set of buttons that read; “Free Mandela,” “Smash Apartheid,” and “Forward Ever, Backwards Never.” That the Reagan administration opposed Nelson Mandela and instead supported the racist jailers of the apartheid regime, is everything one need know about Reagan and his henchmen. Assisting the victory of South Africa’s freedom struggle was one of the U.S. left’s greatest achievements; the objective of stopping militarism and building a just society has yet to be fully realized. 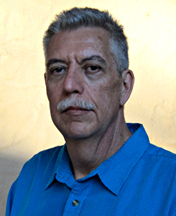 "Stop The War In Central America" - Mark Vallen. 1986. Offset flyer. 8.5 x 11 inches. Stop The War in Central America was originally a large pencil drawing I created in 1986 to express my opposition to Reagan’s policy of military intervention in Central America. The focal point in the artwork are three skeletal figures inspired by the Dia de los Muertos drawings of the great Mexican artist, José Guadalupe Posada (1852-1913), only my skeletons represent the Escuadrones de la Muerte (Squadrons of Death) unleashed by Reagan in the nations of El Salvador and Nicaragua. They are clothed in U.S. supplied military uniforms that have dollar signs as their camouflage pattern. Clutching U.S. supplied M-16 automatic rifles in their decomposing hands, they move threateningly towards the viewer. In the wake of the deathly trio one can see the graveyards of countless victims, the skyline blackened with acrid smoke and bomb-blasts. I published this unsettling image as a flyer and a poster. The flyer announced a mass demonstration scheduled to take place in downtown Los Angeles on November 1, 1986, and 5,000 copies of my self-published flyer were distributed throughout L.A. I simultaneously printed a 22.5 x 28 inch poster of the drawing that did not include the text announcing the rally; that poster had a run of 1,000. Around 20,000 people ultimately participated in the Nov. 1 mass protest. That same month, a U.S. military cargo plane was shot down over Nicaragua killing the three U.S. mercenaries serving as its crew. One “merc,” Eugene Hasenfus, survived the crash and was captured in the jungle by the Sandinistas. The plane was on a covert U.S. operation delivering weapons to the anti-Sandinista “Contra” guerrillas, military aid that the U.S. Congress had expressly forbidden in the 1982 Boland Amendment. 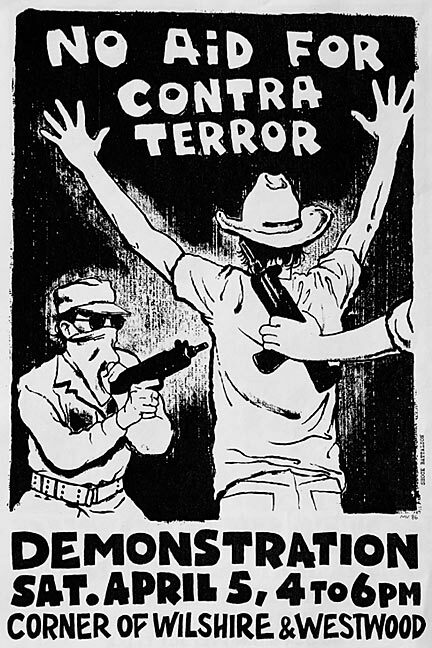 "No Aid For Contra Terror" - Mark Vallen 1986. Offset flyer. 8.5 x 14 inches. Flyer based on the artist's original silkscreen print. My silkscreen image, No Aid For Contra Terror, was also created in April of 1986. Around 200 of the 18.5 x 22.5 inch posters were printed and distributed across Los Angeles. 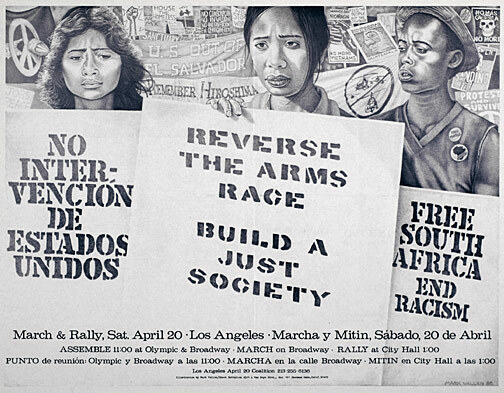 I reduced the artwork, combined it with text announcing a mass anti-war demonstration on the Westside of L.A. on April 5, 1986, and published five thousand 8.5 x 14 inch flyers for citywide distribution; some 5,000 people participated in the protest. Reagan, the State Department, the Pentagon, and the CIA, insisted they had nothing to do with the arms supply to the Contras exposed by the shooting down of the cargo plane over Nicaragua - but the incident started the unraveling of what would become known as the “Iran-Contra Affair,” or “Contra-Gate.” The scandal involved the Reagan administration selling sophisticated weapons to the Islamic regime of Ayatollah Khomeini, which was subject to a U.S. arms embargo, then using the profits from the sales to fund the Nicaraguan “Contra” army, an undertaking forbidden by the U.S. Congress. Reagan denied having any knowledge concerning the secret arms deal with Iran or the illegal arming of the Contras, a denial that allowed for only one of two possibilities; Reagan willfully acted in contravention of U.S. law, or he was totally inept in his duties as President of the United States. Several members of the Reagan White House that were involved in Iran-Contra were charged and convicted of breaking the law, but their convictions were either vacated on appeal, or later pardoned by President George H.W. Bush. "U.S. Out Of Central America" - Mark Vallen 1986. Photomontage offset flyer. 4 x 6.5 inches. U.S. Out Of Central America was a small, 4 x 6.5 inch flyer I designed announcing an anti-war demonstration scheduled to take place on March 24, 1986 in downtown Los Angeles. The crude “ripped and torn” aesthetic of punk was most apparent in this diminutive flyer, for which I took no credit (much of my political and punk artwork at the time was done anonymously). In my rudimentary Xeroxed photomontage I combined a photograph of a smiling Reagan pointing at a book, with a horrific photo of Salvadorans that had been beheaded and mutilated by the U.S. backed Salvadoran military. I self-published 5,000 of these rough little broadsides, and distributed them all across L.A. The works shown in this essay were of an activist nature, made for the street, mostly displaying a rough and ready, unrefined angry aesthetic born of urgency. These works of mine were part of an avalanche of protest art created by dissident artists during the bleak days of “Reaganism.” We are today revisited by that miserabilist political philosophy, and contemporary artists must meet its rising challenge. Web log author, Mark Vallen ©. newsletter, or to send me an e-mail. Hardcover catalog book includes numerous essays and full color illustrations.